As part of a larger project this modest sized en-suite represented a challenge to accommodate a good sized shower, a basin and a toilet. The basin was recessed into the back of disused chimney and the shower and toilet were located at either end. We chose an oak trim on the tile corners to complement the oak floor in the adjacent room. The metro style tiles were used on the walls laid horizontal and the client chose a contrasting green line to break up the white. One wall of this en-suite is constructed of Oak and glass and looks out directly onto a wonderful view. We finished the walls and floor in travertine and wanted to give a spacious but quality feel to the room. The free standing bath was positioned to maximise the view and the spacious shower was set in the corner utilising the space to the maximum. Heating in this room comes from a wet underfloor heating system so the bathroom always feels snug. With two windows and a door all on separate walls we had to be creative to achieve generous sized utilities with tight spaces. The simple shades in colour help to give the en-suite a quality feel with points of interest. The skilling adds to the charm and we chose here to use shower panels and minimal but colourful tiling. We laid vinyl style floor planks throughout the bedroom and ensuite giving continuity between the two rooms. Asked to refurbish this bathroom we started by removing the existing cupboards one of which housed the hot water cylinder. After relining the walls, reconfiguring the electrics and re plastering, we set about installing a simple family bathroom that suited the age of property. The floor is a popular vinyl floor that gives the appearance of a grey wood but has the practicality of being water resistant. Clean lines and uncluttered the room offers simplicity and functionality. This small bedroom was turned into a lovely en-suite for the master bedroom. By opening up a door to the bedroom, closing off the door to the hall and boxing the chimney we had a blank canvass. Whilst a similar style to the family bathroom the addition of warm colours makes this a stylish and warm addition to the house. 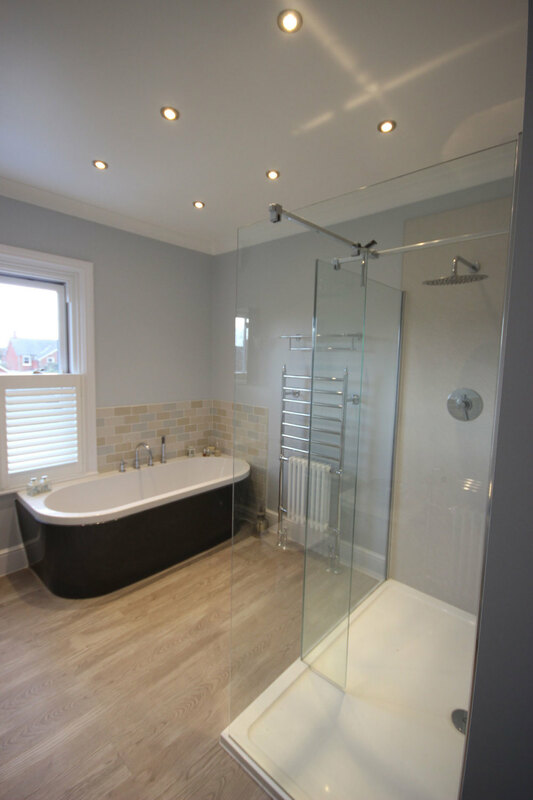 This bathroom was fitted in a one bedroom flat in Christchurch with limited space. A simple bath with shower inset and screen enabled the client to have both options still available. Neutral colours for walls and tiles helped give the impression of a larger space and the slimline toilet and sink added to that feel. This was a simple solution but modernised the bathroom at a sensible cost. Our client chose a colourful option with a nautical theme. The family bathroom was spacious and allowed a free standing bath, quadrant shower, designer sink and traditional toilet. The house built in the 1920’s was laid to a traditional theme throughout and this colourful bathroom added a cheery start to the day. The borders and feature tiles are complimented by the clients choice of blinds and free standing furniture. The second guest shower room was a rustic addition to the house and was restrictive on space. We carried on the theme with a small mosaic tile and bespoke cabinets for a corner toilet and sink. As the walls were solid concrete the supply of services became a challenge. We opted for an electric power shower, a slim-line tray and full width screen.